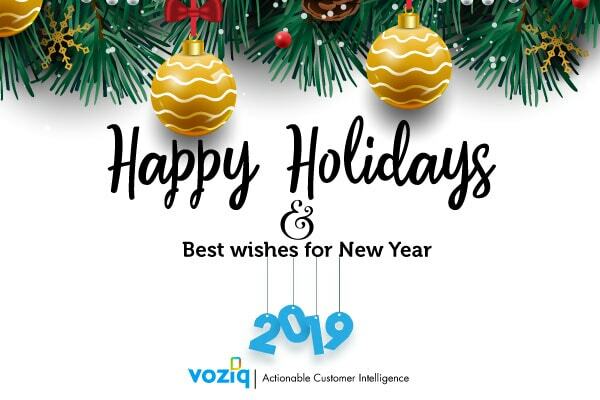 We wish you a joyful holiday season and a Happy New Year from all of us at VOZIQ! The exciting partnerships with our customers have flourished further in 2018. These leading subscription businesses made us a part of their growth and retention story, and we are extremely happy that we have delivered. So, many thanks to each one of them for their support and faith in our product! In 2018, we also strengthened the Artificial Intelligence-Machine Learning core of our platform with 4 new, purpose-built machine learning models. With these, you can now leverage unstructured data to create predictions across entire customer lifecycle and improve NPS and customer retention. All this did not go unnoticed! We won 2018 Unified Communications Product of the Year award for being one of the most innovative unified communications solutions. The road ahead in 2019: Bringing AI within your reach! Artificial intelligence holds the key to unlocking hidden growth potential for businesses of any size. In 2019, we will continue our focus on bringing AI/ML technology to businesses to unlock untapped growth potential based on our customer’s feedback. As part of this effort, we have created a Proof-of-Value service to test AI/ML potential for customer growth use cases in a risk-free and sandboxed environment in less than 2 months. We wish that you will continue your journey of growth and achievement in 2019. As a boutique business focused on solving one important problem with customer retention, we couldn’t have reached these milestones without your feedback and encouragement. So, thank you! Looking forward to your continued support in the New Year.